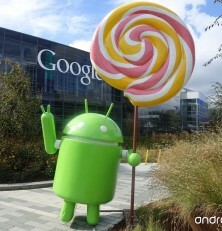 Last week Google finally officially announced the release of the latest version of Android OS dubbed “Lollipop”. The new OS was one of the industry’s worst kept secrets as there was constant talk from the Android world regarding developments on what had previously only been unofficially codenamed “Android L”; a preview of the upcoming firmware release in June. In typical Google fashion they very quietly made the announcement known to the world by erecting a giant Lollipop on their front lawn to stand alongside the other giant desserts depicting its predecessors. Anyways, who really cares about the name right? What does this mean for you the end user? To put it bluntly, this is the most significant update to Android since ICS (Ice Cream Sandwich) was released in late 2011. Google also decided to put a special emphasis on this release by fully incrementing Lollipop’s version number to Android version 5.0. To illustrate how significant this is just consider that the 3 previous major releases (ICS, Jellybean, and Kit Kat) were all technically versioned as Android 4.x. We haven’t seen Google fully increment the version since Honeycomb made way to ICS, again, in late 2011. Ok, that’s nice, it’s a major release; what do I have that’s new? Well, there are definitely some esthetic tweaks in the form of a new design standard being introduce by Google named “Material Design. While the new flat design may be the first things many notice, many of the most significant improvements to Lollipop have taken place under the hood. The impact of these changes may not be immediately evident but will certainly improve your Android experience in the long run. Two of the key points of emphasis has been put performance and battery life. On this note Google has introduced a slew of new features including an entirely new runtime process named “ART” which will replace the current Dalvik runtime environment. For the more tech savvy among us the new runtime promises support for 64-bit devices and performance enhancements up to 4 times better than Dalvik. While the benefits are mostly a bunch of technical jargon what it basically boils down to is a much easier experiences for developers which translates into better apps for you. Other notable tweaks include a new and improved “Battery Saver Mode” said to extend battery life a full 90 minutes, and two new feature that will tell you how much charge you have remaining on your battery, and how much time is left till you’ve reached a full charge will charging. Both displayed in minutes. They’ve also promised much more energy efficient scanning for Bluetooth and NFC. With all that said, one of the things that got me most excited is the mention of, “Improved network handoffs resulting in limited interruption in connectivity.” Any of you who like network heavy activities like streaming or voice calls will appreciate this. Many of you have probably come across a situation where you were watching your favorite sports team or Video Chatting with a loved one when you had to leave the house. What happens then? We’ve all been there, as soon as your device exits your wifi range and switches over to cellular data a whole host of problems pop up often forcing you to restart your application or activity. Google’s advanced handoff protocols promise to make that a thing of the past as you should now be able to transition seamlessly from one connection to another with no stutter. Other new features include multiple profiles for devices, a bunch of audio tweaks, “Ok Google” hotword recognition throughout the OS; including with the screen off, better integration with Android TVs and Chromecast, and a particular nifty feature that allows you to import settings from one phone to another simply by tapping them together (using NFC ofcourse!). The final thing worth mentioning is the addition of Rich Notifications. Rich notifications are the newest way Google will present you with information. In essence these are overlays that will be displayed on your screen which will show you notifications. For those of you using facebook messenger you will notice that this is very reminescnet of Facebook’s chat head feature which is always in the foreground no matter which app is running. You will now be able to reply to messages directly from your lock screen and will even have the ability to set some contacts as “Priority” contacts. A special mode on your phone will make it so that only priority contacts will be able to message you. That’s our quick roundup of Android Lollipop. Feel free to leave your impressions and comments in the comment section below.